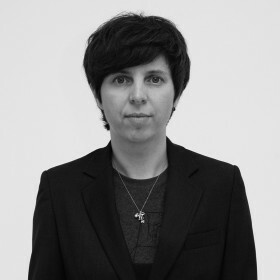 Moira Zoitl (*1968 in Salzburg) is an Austrian video and installation artist. She works and lives in Berlin. She studied at the University for Applied Arts in Vienna from 1990 to 1997 and in 1997 Visual Communication at the University of Arts in Berlin. She recieved invitations for various projects and artist residencies, including Hong Kong (2002/2004), London (2003/2009, bm:ukk), Stockholm (2007, Goethe Institut), and Beijing (2010). In 2004 she recieved the Austrian Federal Stipend for Fine Arts. Her Video works and Installations that evolve around the subjects of migration, urban development, gender, questions of (auto-)biographical and identity were widely exhibited around the world. In 2001 Zoitl had her first solo show at Kunstverein Wolfsburg. Furthermore she exhibited at Sterischen Herbst, Graz (2000), 3. Guangzhou Triennale in China (2008) and Festival Rencontres Internationales in Paris (2011).